New - now includes ultra strong TCT free floating pivot bushings that are self lubricating and eliminates friction. The ReadyLIFT 3.5" SST Lift Kit is developed to give F-150 owners a packaged front/rear lift option that lifts the front of the vehicle 3.5" with 2" in the rear. This creates a popular overall lifted stance that isn't too high, but high enough to allow for 35x11.50 tires. 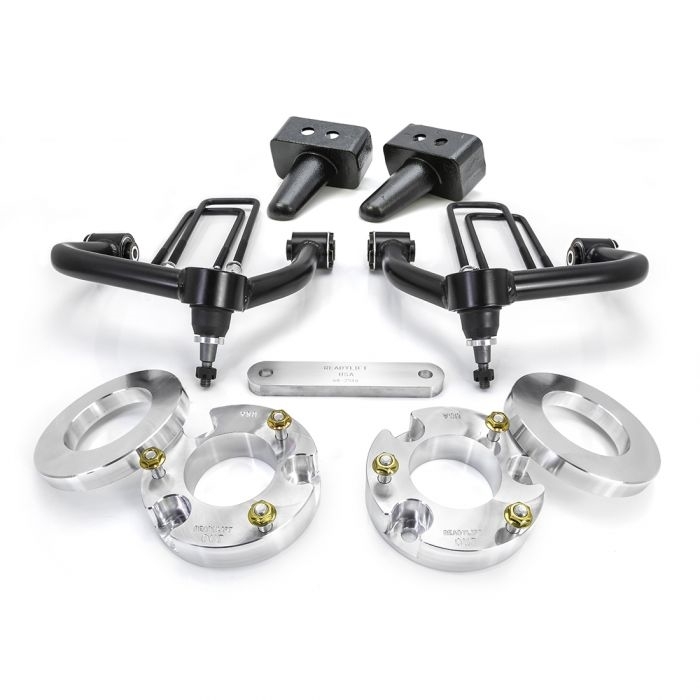 These lift systems capitalize on the popularity of our tubular control arm design SST lift kits while incorporating many great advanced features. AND they are super easy to install! Like many of our popular lift kit systems, these new SST lift kits are centered around our DOM tubular steel Upper Control Arms. Crafting the right arm for the job was critical in the development of this kit design. Our team produced a superior arm that includes a 14-degree ball joint cup to insure proper geometry and alignment. This translates into long tire life as well as excellent handling. Each arm includes our proprietary ReadyLIFT ball joint - the same heavy duty ball joint used in our 3/4-ton truck lift kits. And each arm includes new one-time grease TCT polyurethane bushings. The 3.5" of lift height is achieved using our unique offset top mount spacer design. These CNC-machined billet aerospace-grade Aluminum lift spacers feature a unique offset bolt design engineered to position the strut into the stock position. This translates into proper suspension clearance and guarantees your truck will ride like it was stock. Additionally, we include a machined billet pre-load spacer that installs between the top of the spring and the bottom of the strut hat to pre-load the spring. This also acts as a droop limiter which insures CV axles durability on 4WD models. To lift the rear we include OEM style 3" tall cast rear lift blocks with built in bump stop landing pads. These blocks include dual locator pins.. For trucks with a two-piece driveshaft, we also include a carrier bearing spacer - All of this contributes to an excellent driving and handling suspension system that truly upgrades your Ford F-150 truck!